Martin Truex Jr. was fastest in final practice for Sunday’s Ford EcoBoost 400 (Sarah Crabill/Getty Images North America photo). 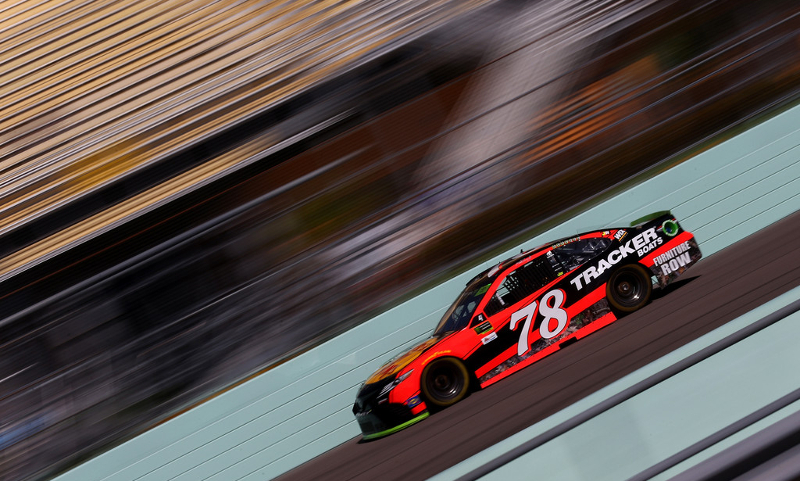 HOMESTEAD, Fla. — Martin Truex Jr. chases his first Cup championship Sunday at Homestead-Miami Speedway and has a fast No. 78 Furniture Row Racing Toyota to show for. Truex led the final practice of the 2017 Monster Energy NASCAR Cup Series season at the 1.5-mile track with a fast time of 31.543 seconds (171.195 mph). The mark was over two-and-a-half tenths quicker than second-fastest Clint Bowyer in the session. 2015 champ Kyle Busch had the fastest 10-lap average at 164.481 mph as Truex was second in that category behind the No. 18 M&M’s Caramel Toyota. Busch (169.492 mph) turned the sixth-quickest single lap during final practice for Sunday’s Ford EcoBoost 400. Bowyer (169.790 mph) slotted in second while pole-sitter Denny Hamlin (169.774 mph) was third. Rookie Erik Jones (169.721 mph) and Ryan Blaney (169.55 mph), driving in his final race for the Wood Brothers, rounded out the rest of the top-five. Kyle Busch was sixth, followed by Dale Earnhardt Jr. (169.364 mph) and Matt Kenseth (169.242 mph), who both started their Cup careers around the same time. Kurt Busch (169.242 mph) and Daniel Suarez (168.85 mph) completed the top-10. Suarez returns to Homestead-Miami Speedway after winning the XFINITY race and title there last fall. Brad Keselowski (11th overall) and Kevin Harvick (18th overall) both ran inside the top-10 of best 10-lap consecutive averages, with Harvick fourth and Keselowski sixth. All 39 cars made a lap in the session as Sunday’s season finale at Homestead is up next for the Monster Energy NASCAR Cup Series.